In Singapore, finding a balance between career and life outside the office is arguably one of the biggest challenges that working adults face. It is not surprising that research shows work-life harmony as a determining factor for employees when it comes to job choice. For those of us who are working parents, juggling work and parenthood can feel like an immense undertaking, as we simultaneously try to meet work expectations and ensure the well-being of our families. Over the past decade, I’ve interviewed individuals and organisations to understand how they effect work-life harmony for themselves, and these insights have helped me in my personal journey. This time of year is usually a whirlwind of school holiday plans for the kids, rushing to tie up loose ends at work and prepping for the annual year-end festivities. Make this year different – rather than getting caught up in the busyness of the season, mindfully set aside time to take stock of the year that has just passed. What were the highs and lows? What were the challenges you managed to overcome, and what were the specific gains in key areas such as personal growth, relationships and career? Experts suggest that reflecting on these times of resilience can not only lift your mood and boost self-esteem but ultimately allow you to start the new year on an energised and positive note. This reflective practice is also a good start to setting your goals for the year ahead, and building on what you have accomplished thus far. Our families undeniably occupy the biggest part of our hearts, but this isn’t always reflected in the amount of time we spend with them. We know that children thrive when they have strong positive relationships with their parents; the time and effort that we spend now will help them grow into strong, resilient and confident adults. Our marriages too, grow stronger when tended. Just before the start of the year, plot important dates such as birthdays and selected school events into the calendar, before your schedule gets filled with work commitments. Planning one-on-one dates with your spouse and children is also a good way to spend focused time with them and fill their love tanks. Interestingly, the more time I invested in my family, the more supportive they have been when I needed to put in longer hours during peak periods at work. A common pitfall we all face is trying to do too many things at once – and expecting ourselves to do them well. The reality is, ‘having it all’ is a myth. While it is possible to juggle career and family, at any given time, our energy can only be focused on one thing. Trying to do it all, all the time, is a sure-fire way to burnout. Scheduling regular time for self-care can help. Whether it’s a quick jog around your neighbourhood, journaling or reading for pleasure, find a simple daily activity that will help you de-stress and keep a healthy perspective as you manage the multiple demands on your time. Once you’ve identified your personal goals for work and family, think about refining the way you currently work in order to meet them. 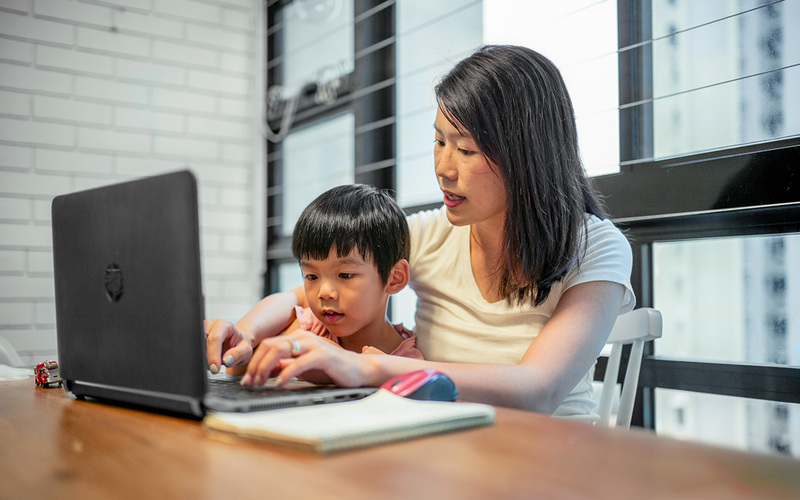 For example, if you want to step up your involvement in your child’s daily activities, you may need to consider a staggered work hours arrangement that will allow you to start work earlier, and also leave earlier to spend the evenings at home with the family. Having a frank discussion with your supervisor is a crucial step in identifying how you can still be an effective contributor at work, even as you increase your presence at home. Having work-life harmony is a delicate balance, and certainly not something that is achieved overnight. Start today by making small changes using the ideas above, and be pleasantly surprised to see the progress you’ve made at the end of next year!